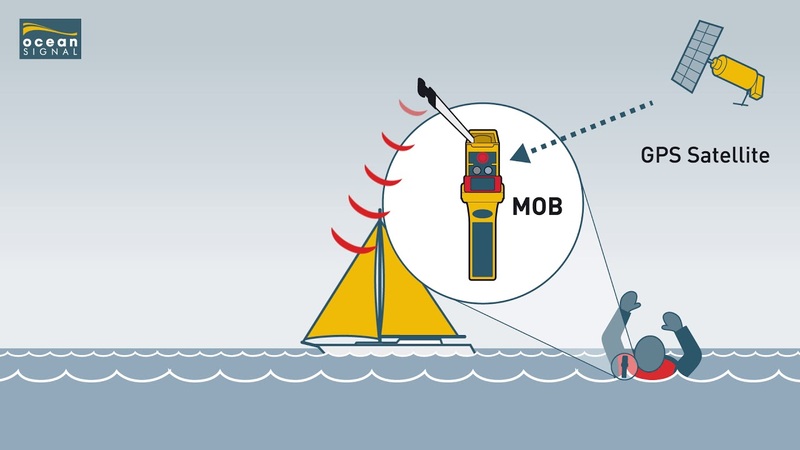 The MOB1 is intended to be installed within the life-jacket and will activate automatically on inflation, sending the first alert within 15 seconds. The MOB1 is waterpoof to 10 metres. Can I cange the DSC MMSI number is I move to a different vessel? Yes, it is possible to reprogram the MMSI number used to call your DSC radio as many times as you like using the normal applications. There is no need to delete the old number first. The new number will simply overwrite the old MMSI number. Each time you programme the MOB1 it will use a small amount of the battery capacity and reduce the operating lifetime by a few minutes each time. What is the black cord supplied for? The provided length of cord is supplied as a safeguard against accidental loss. The cord (lanyard) should be used to tether the MOB1 to a fixed point on the lifejacket that will not inhibit inflation or detach/untie if the MOB1 is accidentally removed from its bracket. The MOB1 fixing point for the cord is located on the top of the unit. A video showing the programming sequence for the MOB1 can be found at this link.. Remember to set the display brightness to full before starting the sequence. Note that the test key is being pressed directly and then the rubber adaptor fitted when the MOB is ready to programme. If the unit fails to programme, showing the flashing red LED on completion, please try again. Turn the MOB1 on in programming mode again and retry. There is no need to exit the programming screen on the programme. If the programming page is showing, simply press F10 again to commence the programming sequence again. Note that the red flashing may tecke several seconds to start after the on screen sequence has finished. 2) Ensure that you have commenced programming within 50 seconds of putting the MOB1 into programming mode. Failure to do this will cause the MOB1 to have turned off before communication starts. Note that once programming has commenced (The white box is flashing) the MOB1 should stay on until the programming sequence is completed. Ideally the MOB1 should be put into programming mode just before placing the MOB1 in front of the white square. 5) The MOB1 configuration software requires precise timing, which may be disrupted by other applications running at the same time, especially on slower computers. If you still encounter problems, try shutting down all un-necessary applications, including anti-virus software. 6) On laptops, the F10 key will require using in conjunction with the Function (labelled Func or Fn) to start the white box flashing black and white to send the data to the MOB1. Most keyboards will colour the F keys in the same colour as the Function key to identify this. 7) The MOB1 MMSI programming software is only available for Windows PCs. For users of other operating systems and smart phones and tablets there is an online application available. This can be accessed using the button on the installers web page. Note that it can only be used online.